Description: A medium to large (10-17mm) pubescent black beetle with red legs. Common in grassland, gardens, arable land, waste ground etc. Phytophagous, sometimes a pest of strawberries. World Distribution: A Eurasian Wide-temperate species (65) found south across Europe to north Africa, Macaronesia, Asia Minor and Iran, and east across Siberia to Japan. Introduced in North America. Irish Status: Widespread and common on agricultural soils at low altitude. 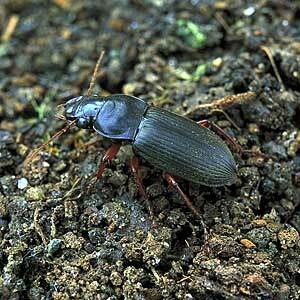 Ecology: Eurytopic on agricultural soils, mainly on arable land, but also widely in hedgebanks and waste places. Not recorded from deep peat, and therefore absent from large areas of the north and west.